The Aguacateco are an indigenous people group who have migrated from the mountains of Guatemala and who maintain their pre-Columbian language and culture. Many indigenous Mayans from Guatemala have immigrated to the United States in an attempt to flee war, violence and poverty in their home country. Some Aguacateco have settled in North Carolina, and gained some degree of fame as a result of a labor strike against a Poultry Processing plant where they were employed. Their primary language is Aguacateco, and their primary religion is a form of Roman Catholicism mixed with ethnic Mayan religion rooted in the reverence of their ancestors and spirits in nature. 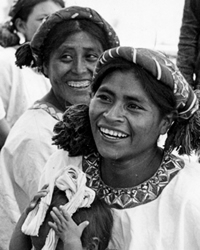 Conversion to Biblical Christianity is seen as cultural assimilation, although there have been a number of Aguacateco who have come to Christ. Some Aguacateco in the USA have worked hard to maintain their cultural practices and religion, while others seek to blend into the larger Hispanic or American culture. Pray God will reveal to the Aguacateco people that conversion to Biblical Christianity does not mean cultural assimilation yet means that Christ makes one's ethno-linguistic identity whole. Pray evangelical Aguacateco who have come to Christ will boldly share their faith. Pray God will send Christians to live and work among Aguacateco people.